Chris joined the TART Trails board in 2014. After which he became treasurer, and by March 2018 he was vice president. Since he spends his spare time on a bike, too, we checked in with Chris about the best Northern Michigan winter trails. My favorite place to be outside. I like to hike and bike year-round on these trails. A great mix of hills and some single-track right in town. Tip: Stop at the rope swing that hangs over a creek behind the Greenspire School. This trail starts in Traverse City and stretches all the way to Suttons Bay. I have only run and biked on this trail in the winter, but it is groomed for skiing as well. It’s plowed all the way to DeYoung Nature area and groomed thereafter. Tip: I like that this trail is long and flat, so you can keep a pretty consistent pace over a longer period. The location is really convenient to get a workout in with limited time in the winter. Tip: A great way to become more familiar with the trails is to attend the Friday Night Lights group ride. There is a potluck that follows. There is a Facebook event for it usually. 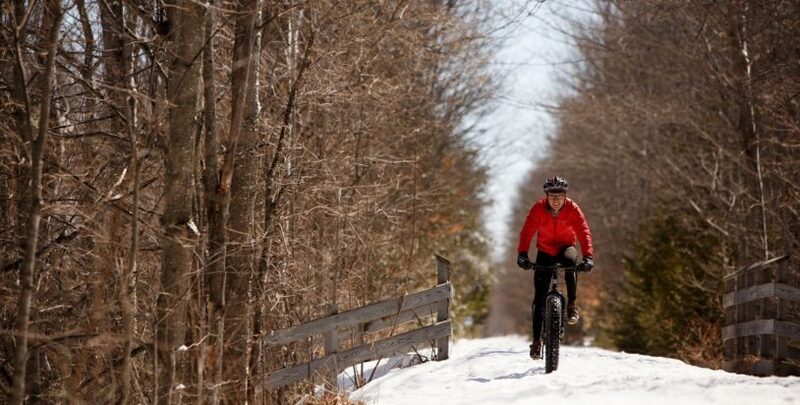 Plus, riding the winter singletrack is great training for riding summer singletrack. This 31.5-mile trail system is just outside of Bellaire. You can hike, ski or fat bike here. It also has good signage and is groomed by NMMBA. There is a mountain bike race mid-August at Glacial Hills that supports the maintenance of the trail system. Tip: There are guided group hikes and bike rides held regularly throughout the year. Follow Glacial Hills Trails on Facebook to get notifications about upcoming events. The VASA Pathway is one of the more popular trails in the area. The trailhead is off of Bartlett Road on the east side of Traverse City. The VASA is used primarily for cross country skiing in the winter time. I am a novice in skiing and only classic ski here. I spend most of my time mountain biking in the summer. The VASA is groomed by TART Trails and has excellent signage. Tip: My favorite thing to do after cross country skiing the VASA is to go to dinner at Mt. Holiday, which is nearby. The Cadillac Pathway has a new winter sports trail groomed for fat bikes. I like to stop there for a quick ride when I am heading downstate. Proceeds from the Bear Claw Mountain Bike Race in September support trail maintenance. Tip: The groomed trail is for ALL users (runners, dogs, snowshoers, bikers) since it’s separate from the cross country ski trail. You can do the full 11-mile trail or turn back when you’re ready. Note: the trail is only open if there are 6 or more inches of snow.